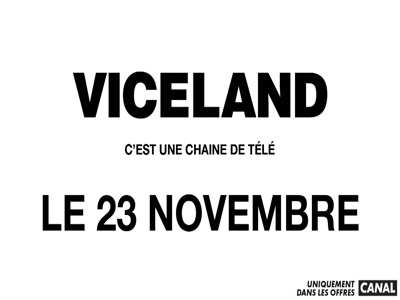 Canal: Viceland is now encrypted in Mediaguard 3 & Nagravision 3 & Viaccess 3.0 (11856.00MHz, pol.V SR:29700 FEC:5/6 SID:8207 PID:710[MPEG-4] /721 French). Canal: A new channel has started in DVB-S2 Clear: Viceland (United Kingdom) on 11856.00MHz, pol.V SR:29700 FEC:5/6 SID:8207 PID:710[MPEG-4]/721 French. Sky Digital: A new channel has started in DVB-S VideoGuard: Viceland (United Kingdom) on 11836.00MHz, pol.H SR:27500 FEC:5/6 SID:5115 PID:514/642 English.